Tanks are armoured fighting vehicles designed for front-line combat, combining operational mobility and tactical offensive and defensive capabilities; tanks perform all primary tasks of the armoured troops. The tank destroyer on the other hand is specifically designed to take on enemy tanks and other armoured fighting vehicles. Many are based on a tracked tank chassis, while others are wheeled. Since World War II, gun-armed tank destroyers have fallen out of favor as armies have favored multirole main battle tanks. However, lightly armored anti-tank guided missile (ATGM) carriers are commonly used for supplementary long-range anti-tank work. The resurgence of expeditionary warfare in the first two decades of the 21st century has seen the emergence of gun-armed wheeled vehicles, sometimes called protected gun systems, which may bear a superficial resemblance to tank destroyers, but are employed as direct fire support units typically providing support in low-intensity operations such as the wars in Iraq and Afghanistan. Dedicated anti-tank vehicles made their first major appearance in the Second World War as combatants developed effective armored vehicles and tactics. Some were little more than stopgap solutions, mounting an anti-tank gun on a tracked vehicle to give mobility, while others were more sophisticated designs. An example of the development of tank destroyer technology throughout the war are the Marder III and Jagdpanzer 38 vehicle, that were very different in spite of being based on the same chassis: Marder was straightforwardly an anti-tank gun on tracks whereas the Jagdpanzer 38 traded some firepower (its Pak 39, designed to operate within the confines of a fully armored fighting compartment, fires the same projectiles from a reduced propellant charge compared to Marder's Pak 40) for better armor protection and ease of concealment on the battlefield. Except for most American designs, tank destroyers were all turretless and had fixed or casemate superstructures. When a tank destroyer was used against enemy tanks from a defensive position such as by ambush, the common lack of a rotating turret was not particularly critical, while the lower silhouette was highly desirable. The turretless design allowed accommodation of a more powerful gun, typically a dedicated anti-tank gun (in lieu of a regular tank's general-purpose main gun that fired both anti-tank and high explosive ammunition) that had a longer barrel than could be mounted in a turreted tank on the same chassis. The lack of a turret increased the vehicle's internal volume, allowing for increased ammunition stowage and crew comfort. Eliminating the turret let the vehicle carry thicker armor, and also let this armour be concentrated in the hull. Sometimes there was no armored roof (only a weather cover) to keep the overall weight down to the limit that the chassis could bear. The absence of a turret meant that tank destroyers could be manufactured significantly cheaper, faster, and more easily than the tanks on which they were based, and they found particular favor when production resources were lacking. After hard lessons early in the war, machine guns were mounted for use against infantry, but the limited traverse of the mounting meant that they were still less effective than those used on turreted tanks. Variants of the Polish TKS and TK-3 tankettes up-armed with 20 mm gun (23–26 vehicles) were operationally deployed in the invasion of Poland. They were used as an anti-tank component of the reconnaissance units. Due to the quick defeat of France, few French vehicles were built. The Laffly W15 TCC (Chasseur de char) was an attempt to quickly build a light tank destroyer by mounting a 47 mm SA37 anti-tank gun onto a lightly armored Laffly W15T artillery tractor. Other French tank destroyers were being developed, including the SOMUA SAu-40, ARL V39 and various ad hoc conversions of the Lorraine 37L. The first German tank destroyers were the Panzerjäger ("tank hunters"), which mounted an existing anti-tank gun on a convenient chassis for mobility, usually with just a three-sided gun shield for crew protection. For instance, 202 obsolete Panzer I light tanks were modified by removing the turret and were rebuilt as the Panzerjäger I self-propelled 4.7 cm PaK(t). Similarly, Panzer II tanks were used on the eastern front. Captured Soviet 76.2 mm anti-tank guns were mounted on modified Panzer II chassis, producing the Marder II self-propelled anti-tank gun. The most common mounting was a German 75 mm anti-tank gun on the Czech Panzer 38(t) chassis to produce the Marder III. The Panzer 38(t) chassis was also used to make the Jagdpanzer 38 casemate style tank destroyer. The Panzerjäger series continued up to the 88 mm equipped Nashorn. German tank destroyers based on the Panzer III and later German tanks were unique in that they had more armor than their tank counterparts. One of the more successful German tank destroyers was actually designed as a self-propelled artillery gun, the Sturmgeschütz III. Based on the Panzer III tank chassis, the Sturmgeschütz III was originally fitted with a low-velocity gun, and was assigned to the artillery arm for infantry fire support. Later, after encountering Soviet tanks, it was refitted with a comparatively short-barreled high-velocity anti-tank gun, usually with a muzzle brake, enabling it to function as a tank destroyer. The Sturmgeschütz III from its 1938 origin used a new casemate-style superstructure with an integrated design similar to the later Jagdpanzer to completely enclose the crew. It was employed in infantry support and offensive armored operations as well as in the defensive anti-tank role. The StuG III was the most-produced German armored fighting vehicle of any type built during the war years, with some 10,000 examples built from January 1940 through March 1945. Although the early German Panzerjäger carried more effective weapons than the tanks on which they were based, they were generally lacking in protection for the crew, having thinly armored open-topped superstructures. The "open-topped" design format of the Panzerjäger vehicles was succeeded by the Jagdpanzer '("hunting tanks"), which mounted the gun in true casemate-style superstructures, completely enclosing the crew compartment in armor that was usually integral to the hull. The first of these Jagdpanzers was the 70-ton Ferdinand (later renamed Elefant), based on the chassis, hulls, and drive systems of ninety-one Porsche VK4501 (P) heavy tanks, mounting a long-barreled 88 mm cannon in an added casemate, more like the earlier Panzerjägers had with their added-on armor shielding for the gun crew, but in the Ferdinand completely enclosing the gun and firing crew in the added casemate, as the later purpose-built Jagdpanzers would. However, the Ferdinand was mechanically unreliable and difficult to maneuver, and once all ninety-one unturreted "Porsche Tiger" hulls/drive systems were converted, no more were built. The German Army had more success with the Jagdpanther. 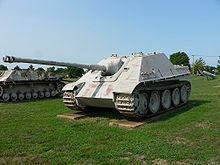 Introduced in mid-1944, the Jagdpanther, of which some 415 examples were produced, was considered the best of the casemate-design Jagdpanzer designs. It featured the same powerful PaK 43 88 mm cannon used on the unwieldy Elefant, now fitted to the chassis of the medium Panther tank, providing greatly improved armor-penetrating capability in a medium-weight vehicle. 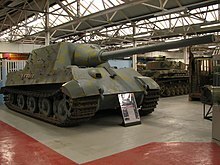 Facing an increasingly defensive war, the German Army turned to larger and more powerfully armed Jagdpanzer designs, and in July 1944 the first Jagdtiger rolled off the production line; it was the heaviest German armored fighting vehicle to go into active service. The Jagdtiger featured a huge 128 mm PaK 44 cannon and heavy armor protection. Only 88 Jagdtiger vehicles were produced, barely matching the total number of the earlier Ferdinand/Elefant vehicles. They were first deployed to combat units in September 1944. The decision of German armored vehicle designers to use a casemate-style superstructure for all tank destroyers had the advantage of a reduced silhouette, allowing the crew to more frequently fire from defilade ambush positions. Such designs were also easier and faster to manufacture and offered good crew protection from artillery fire and shell splinters. However, the lack of a rotating turret limited the gun's traverse to a few degrees. This meant that the driver normally had to turn the entire tank onto its target, a much slower process than simply rotating a powered turret. If the vehicle became immobilized due to engine failure or track damage, it could not rotate its gun to counter opposing tanks, making it highly vulnerable to counterfire. This vulnerability was later exploited by opposing tank forces. Even the largest and most powerful of German tank destroyers were found abandoned on the field after a battle, having been immobilized by one or more hits by high explosive (HE) or armor-piercing (AP) shells to the track or front drive sprocket. The most famous Italian tank destroyer of the Second World War was technically not a tank destroyer, but self-propelled artillery. The Semovente da 75/18, based on the M13/40 frame, was developed to support front-line infantry, and therefore has fixed armament: a 75 mm gun in casemate. However, thanks to its low height (185 cm) and the caliber of its gun the 75/18 also had good results in anti-tank combat, fighting against British and American (but not Soviet) units. After the Armistice of 1943, the 75/18 remained in use by German forces until Italy's liberation. Built on the same frame, the Semovente da 105/25 was equipped with a 105 mm gun and known as "bassotto" (Italian for dachshund) due to its lower height. As manufacturing began in 1943, the 105/25 was used by German forces. A further development was the Semovente da 75/46, which had a longer gun than the 75/18 and inclined armour 100 mm thick, making it similar to Sturmgeschütz III. Only 11 of these were manufactured. Before the Semovente da 75/18, the L40, built on an L6/40 frame, saw action in Africa and in Russia, but with disappointing results. As of 2017, Italian forces use the wheeled tank destroyer Centauro, armed with a 105 or 120 mm gun. As with the Germans of 1943, most of the Soviet designs mounted anti-tank guns, with limited traverse in casemate-style turretless hulls, in a general design format looking much like the Germans' own Jagdpanzer vehicles. The results were smaller, lighter, and simpler to build weapons that could carry larger guns than any contemporary tank, including the King Tiger. The Soviets produced high numbers of the 85 mm SU-85 and 100 mm SU-100 self-propelled guns based on the same chassis as the T-34 medium tank; the heavier-duty powertrain and hull of the IS-2 heavy tank were instead used to produce the heavier-hitting 122 mm-armed ISU-122 and 152 mm-armed ISU-152, both of which had impressive anti-tank capabilities earning each of them the Russian nickname Zveroboy ("beast killer") for their ability to destroy German Tigers, Panthers and Elefants. The predecessor of the ISU 152 was the SU-152, built on the KV-1s chassis and shared many similarities (including its gun) with the ISU-152. The ISU-152 built as a heavy assault gun, relied on the weight of the shell fired from its M-1937/43 howitzer to defeat tanks. In 1943, the Soviets also shifted all production of light tanks like the T-70 to much simpler and better-armed SU-76 self-propelled guns, which used the same drive train. The SU-76 was originally designed as an anti-tank vehicle, but was soon relegated to the infantry-support role. U.S. Army and counterpart British designs were very different in conception. U.S. doctrine was based, in light of the fall of France, on the perceived need to defeat German blitzkrieg tactics, and U.S. units expected to face large numbers of German tanks, attacking on relatively narrow fronts. These were expected to break through a thin screen of anti-tank guns, hence the decision that the main anti-tank units—the Tank Destroyer (TD) battalions—should be concentrated and very mobile. In practice, such German attacks rarely happened. Throughout the war, only one battalion ever fought in an engagement like that originally envisaged (the 601st, at the Battle of El Guettar). The Tank Destroyer Command eventually numbered over 100,000 men and 80 battalions each equipped with 36 self-propelled tank destroyers or towed guns. Only a few shots were expected to be fired from any firing position. Strong reconnaissance elements were provided so that TDs could use pre-arranged firing positions to best advantage. Flanking fire by TDs was emphasized, both to penetrate thinner enemy side armor, and to reduce the likelihood of accurate enemy return fire. All American tank destroyers were officially known by exactly the same collective term used for American self-propelled artillery ordnance, gun motor carriage. The designs were intended to be very mobile and heavily armed. Most of the tank-hull based designs used special open-topped turrets, of a differing design to the original tank it was based on, which was meant to both save weight and to accommodate a larger gun. The earliest expedient design was an M3 Half-track mounting an M1897 75 mm gun in a limited-traverse mount, and called the 75 mm Gun Motor Carriage M3. Another, considerably less successful, early design mounted a 37-mm anti-tank gun in the bed of a Dodge 3/4-ton truck—the 37-mm GMC M6. By far the most common US design, and the first that was fully tracked and turreted (which became the American hallmark of World War II "tank destroyer" design) was the 3in Gun Motor Carriage M10, later supplemented by the 90 mm Gun Motor Carriage M36—both based on the M4 Sherman hull and powertrain—and the 76 mm Gun Motor Carriage M18 (Hellcat), based on a unique hull and powertrain design, with a slight visual resemblance to what was used for the later M24 Chaffee light tank. The M18 came closest to the US ideal; the vehicle was very fast, small, and mounted a 76 mm gun in a roofless open turret. The M36 Jackson GMC possessed the only American-origin operational gun that could rival the vaunted 88 mm German anti-tank ordnance, the 90 mm M3 gun, and the M36 remained in service well after World War II. The only dedicated American-origin, casemate hull design fighting vehicle of any type built during the war, that resembled the German and Soviet tank destroyers in hull and general gun mounting design, was the experimental T28 Super Heavy Tank, which mounted a 105 mm T5E1 long-barrel cannon, which had a maximum firing range of 12 miles (20 km), and was originally designed as a self-propelled assault gun to breach Germany's Siegfried Line defenses. Of these tank destroyers, only the 90 mm gun of the M36 proved effective against the frontal armor of Germans' larger armored vehicles at long range. The open top and light armor made these tank destroyers vulnerable to anything greater than small-arms fire. As the number of German tanks encountered by American forces steadily decreased throughout the war, most battalions were split up and assigned to infantry units as supporting arms, fighting as assault guns or being used essentially as tanks. In this sense they were an alternative to the Independent tank battalions that were attached to various Infantry Divisions. The expectation that German tanks would be engaged in mass formation was a failed assumption. In reality, German attacks effectively used combined arms on the ground, fighting cohesively. American tank destroyer battalions comprised three tank destroyer companies supported by nine security sections. The single-purpose tactics of the tank destroyer battalion failed to account for non-tank threats. British tanks in the early years of the war, both infantry and cruiser, were (with the exception of the pre-war Matilda I design) equipped with a gun capable of use against contemporary enemy tanks—the 40 mm Ordnance QF 2 pounder. This was replaced with the 57 mm Ordnance QF 6 pounder when that became available. There was extra impetus given to the development of anti-tank weaponry, which culminated in the 76mm Ordnance QF 17 pounder, widely considered one of the best anti-tank guns of the war. Towed anti-tank guns were the domain of the Royal Artillery rather than the Royal Armoured Corps and vehicles adapted to mount artillery, including anti-tank self-propelled guns such as the Deacon (6pdr on an armoured wheeled truck chassis) and Archer (17pdr on tracked chassis), were their preserve, as were US-supplied vehicles. A British Achilles self-propelled anti-tank gun on the east bank of the Rhine. The self-propelled guns that were built in the "tank destroyer" mould came about through the desire to field the QF 17 pounder anti-tank gun and simultaneous lack of suitable standard tanks to carry it. As a result, they were of a somewhat extemporized nature. Mounting the gun on the Valentine tank chassis in a fixed superstructure gave the Archer, looking somewhat like the light-chassis German Marder III in appearance. The 17 pounder was also used to re-equip the US-supplied M10 Tank Destroyer, replacing the American 3-inch gun to produce the 17pdr SP Achilles. While there was a general move to a general purpose gun that was usable against both tanks and in supporting infantry, there was a need to put the 17 pdr into a tank for use against the enemy's heavy tanks. The Cruiser Mk VIII Challenger was a project to bring a 17 pdr tank into use to support the Cromwell cruiser tank. Delays led to it being outnumbered in use by the Sherman Firefly—but a derivative of Challenger was the more or less open-topped variant Avenger, which was delayed until post war before entering service. A cut-down 17 pdr, the 77mmHV was used to equip the Comet tank in the last year of the war. The closest the British came to developing an armored tank destroyer in the vein of the German Jagdpanzers or Soviet ISU series was the Churchill 3-inch Gun Carrier—a Churchill tank chassis with a boxy superstructure in place of the turret and mounting a 3-inch anti-aircraft gun. Although a number were ordered and fifty delivered in 1942, they were not put into service as the immediate threat passed. The design was rejected in favor of developing a 17 pounder armed Cromwell tank variant, ultimately leading to the Comet tank. The Tortoise "heavy assault tank", intended for use in breaking through fixed defensive lines, was well armoured and had a very powerful 32-pounder (94 mm) gun, but did not reach service use. By 1944, a number of the Shermans in British use were being converted to Sherman Fireflies by adding the QF 17 pounder gun. Initially this gave each troop (platoon) of Shermans one powerfully armed tank. By war's end—through the production of more Fireflies and the replacement of Shermans by British tanks—about 50% of Shermans in British service were Fireflies. During World War 2, the Romanians made some tank destroyers by removing the turrets of some of their tanks and adding a compartment and a stronger gun that could face the new Soviet tanks that were much stronger than the Romanian ones. One of these tank destroyers was the TACAM T-60 created on the hull of the Soviet T-60 light tank by removing its turret and adding a compartment together with a 76,2 FL-22 L/51 model 1936 gun. Another tank destroyer was the TACAM R-2 created by removing the turret of the R-2 light tank (name of the Czechoslovakian LT vz. 35 in the Romanian army) and adding to it a compartment together with a Soviet 76.2mm ZiS-3 gun. There were 21 pieces made of which 1 survived and can be found in the National Military Museum, Bucharest. The only turreted tank destroyer made by Romania was the Vânătorul de care R-35, created by extending the turret of the French Renault R-35 tank and adding to it a 45 mm gun instead of its 37 mm gun. Another tank destroyer was the Mareşal, which is credited with being the inspiration for the German Jagdpanzer 38(t). The first prototypes were made on a modified T-60 hull and were equipped with a 122 mm Soviet howitzer. Another gun, used by the late prototypes, was the Romanian 75 mm DT-UDR 26 Reşiţa. The prototypes and plans were captured by the Soviets after they invaded Romania. Two planned tank destroyers were the TACAM R-1 and the TACAM T-38. A West German Kanonenjagdpanzer with 90 mm gun. In the face of the Warsaw Pact, a general need for extra firepower was identified. In the late 1960s, West Germany developed the Kanonenjagdpanzer, essentially a modernized World War II Jagdpanzer mounting a 90 mm gun. As Soviet designs became more heavily armored, the 90 mm gun became ineffective and the Kanonenjagdpanzers were retrofitted for different roles or retired. Some provisions were made for the fitting of a 105 mm cannon, and many of the vehicles were modified to fire HOT or TOW missiles in place of a main gun. These upgraded variants remained in service into the 1990s. With the development of flexible anti-tank missiles, which were capable of installation on almost any vehicle in the 1960s, the concept of the tank destroyer has morphed into light vehicles with missiles. With the weight of main battle tanks growing to the forty to seventy-tonne range, airborne forces were unable to deploy reasonable anti-tank forces. The result was a number of attempts to make a light vehicle, including the conventional ASU-85, the recoilless rifle-armed Ontos, and missile-armed Hornet Malkara armored car and Sheridan light assault vehicle. The latest entry into that category is the 2S25 Sprut-SD, armed with a current-issue 125 mm tank gun that is also capable of launching missiles like the 9M119 Svir. Many forces' infantry fighting vehicles (IFVs) carry anti-tank missiles in every infantry platoon, and attack helicopters have also added anti-tank capability to the modern battlefield. But there are still dedicated anti-tank vehicles with very heavy long-range missiles, and ones intended for airborne use. There have also been dedicated anti-tank vehicles built on ordinary armored personnel carrier or armored car chassis. Examples include the U.S. M901 ITV (Improved TOW Vehicle) and the Norwegian NM142, both on an M113 chassis, several Soviet ATGM launchers based on the BRDM reconnaissance car, the British FV438 Swingfire and FV102 Striker and the German Raketenjagdpanzer series built on the chassis of the HS 30 and Marder IFV. A US Army combined arms battalion has two infantry companies with TOW missile-armed Bradley IFVs and can bring a large concentration of accurate and lethal fire to bear on an attacking enemy unit that uses AFVs. They can be complemented by mobile units of AH-64 Apache helicopters armed with Hellfire antitank missiles. Missile carrying vehicles however are referred to as anti-tank missile carriers instead of tank destroyers. Some gun-armed tank destroyers remain in use. China has developed the tracked PTZ89 and the wheeled PTL02 tank destroyers. The PTZ89 is armed with a 120 mm smoothbore cannon while the PTL02, developed by NORINCO for the PLA's new light (rapid reaction) mechanized infantry divisions, carries a 100 mm one (a version armed with a 105 mm rifled gun is available for export). The PTL02 is built on the 6×6 wheeled chassis of the WZ551 APC. Italy and Spain use the Italian-built Centauro, a wheeled tank destroyer with a 105 mm cannon. ^ von Senger and Etterlin (1960), The World's Armored Fighting Vehicles, p. 9. ^ A. Jońca, R. Szubański, J. Tarczyński, Wrzesień 1939 Pojazdy Wojska Polskiego, Wyd. WKiŁ, Warszawa 1990, s. 72. ^ There were also 37 mm armed TKS-D (2 experimental vehicles) or 45 mm armed TKD (4 experimental vehicles). It is not sure whether they were used operationally at all. ^ Irwin, pp. 61–62: Even the U.S. M4 Sherman could disable a Jagdpanther's track or fracture the front drive sprocket with a 75 mm HE shell. As the crew abandoned their vehicle, they were easy targets for enemy machinegun fire. ^ Gabel, Christopher R. (1985). Seek, Strike and Destroy: US Army Tank Destroyer Doctrine in World War II. DIANE Publishing. pp. 68–69. ISBN 9781428915770. Retrieved 4 May 2015. ^ Axworthy, Mark; Scafes, Cornel; Craciunoiu, Cristian (1995). Third Axis, Fourth Ally: Romanian Armed Forces in the European War, 1941-1945. London: Arms and Armour. ISBN 1-85409-267-7. ^ Kliment, Charles K.; Francev, Vladimír (1997). Czechoslovak Armored Fighting Vehicles. Atglen, PA: Schiffer. ISBN 0-7643-0141-1. Perrett, Bryan (1987). Soviet Armour Since 1945. London: Blandford Press. ISBN 0-7137-1735-1. Gelbart, Marsh (1996). Tanks: Main battle and light tanks. London: Brassey's. ISBN 1-85753-168-X. Forty, George and Livesy, Jack, eds. The Complete Guide to Tanks & Armoured Fighting Vehicles. London: Anness Publishing Ltd., 2006. ISBN 1-84681-110-4.